A Just Giving page has been set up to help our campaign as we may need to appoint a barrister and a forensic accountant to find where all the money has gone! 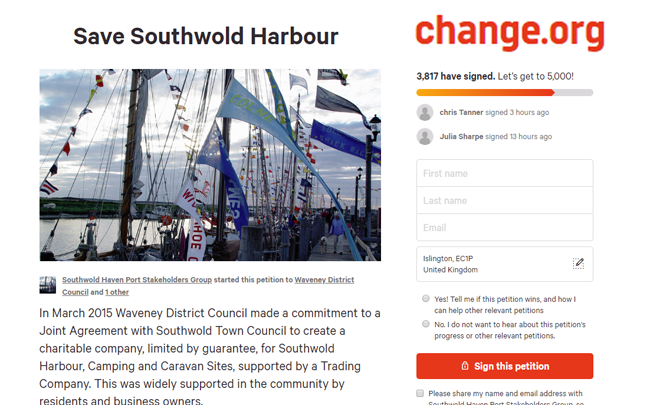 Almost 4000 so far have signed at time of writing this (1 Nov 2018) with many more signing written petitions at the harbour. and Bill Steele of Southwold Haven Port Stakeholders Group. 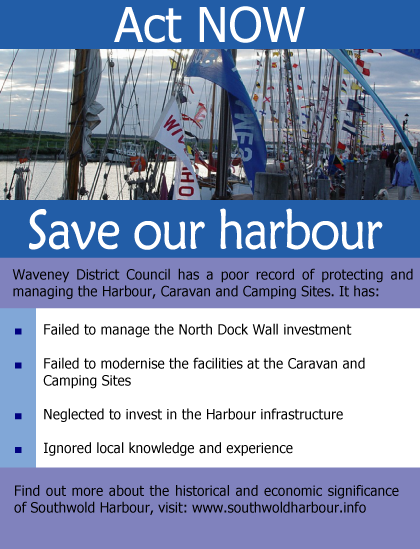 Attendees: Kerry Blaire and Andrew Jarvis of Waveney District Council, Southwold Haven Port Users Group, a representatives from Southwold Caravan Owners, Southwold Town Council sent their apologies. Waveney District Council’s issues with the 2015 model – The level of investment needed is too much for a trust (about £20m over the 20 years) and the worry about WDC being landed with it after insolvency. Explanation as to Harbour Users view – The neighbourhood plan proposes bringing the harbour under local control. The original business and investment plan submitted for the Harbour Trust is still valid. The outstanding investment needs – the south training arm and caravan site improvements – comes to £4.6m over the next 20 years, within the harbour’s ability to pay with annual revenues of £750,000. Investment plan – A scoping document is being worked on to prepare an investment plan. Question – Should the harbour investment plan also include works to banks above the Bailey Bridge? The Harbour and coastal defences are inextricably linked. Possibility of sales to, or takeover by, commercial interests – WDC recognised that the Harbour being controlled by WDC owning the one and only share was unacceptable to users. A possible governance compromise would be WDC 2, STC 2 and Independent 3, giving no group an absolute majority, but ensuring a democratic majority. AOB Trust – History was excluded from the discussions but it was recognised that WDC needed to build trust. It was recognised however that the harbour is being run better than it was. Full public consultation on the proposal is needed. Actions In about two months the new proposal will be put to the Joint Harbour Committee and the Southwold Town Council, with the investment and business plan, for public consultation. in 2003 to sell the land. valuable asset will be lost forever.